Regional production-trade network (RPTN) refers to a vertical industry collaboration system between countries that are geographically close to each other. Within a RPTN, each country specialized in certain portions of supply chain activities based on its respective comparative advantages so as to maximize the efficiency of the whole supply chain. Asia: more economically advanced countries/regions such as Japan, South Korea, Taiwan, Hong Kong and China supply textiles to the less economically developed countries such as Vietnam, Bangladesh and Sri Lanka for apparel manufacturing, where the wage level was much lower. On the other hand, Japan is a leading apparel importer and consumption market in Asia. Europe: among EU members, textile inputs can be supplied by developed countries in Southern and Western Europe such as Italy and Germany. In terms of apparel manufacturing in the European Union, low and medium-priced products can be undertaken by developing countries in Southern and Eastern Europe such as Poland and Romania, whereas high-end luxury products can be produced by Southern and Western European countries such as Italy and France. Furthermore, finished apparel can be shipped to developed EU members such as UK, Germany, France and Italy. America: within the region, the United States as a developed country supplies textile materials to developing countries in North, Central and South America (such as Mexico and countries in the Caribbean region), which assemble imported textiles into apparel by taking advantage of the local low labor cost. The finished apparel articles are eventually exported to the United States for consumption. One is Asian countries’ growing dependence on textile supply from within the region, which rose to 90.2% in 2014 from 87.7% in 2000. This is a reflection of a growing integrated T&A supply-chain in Asia. As a result, apparel “Made in Asia” is becoming even more price-competitive in the world marketplace today and this has posted pressures on the operation of the T&A RPTNs in EU and America. Second one is the stable intra-region trade pattern both for textile and apparel in EU. In 2014, 58.8% of EU’s (28 members) textile imports and 46.2% of apparel imports came from other EU members; at the same time, 68.8% of EU’s (28 members) textile exports and 74.7% of apparel exports also went to other EU members. 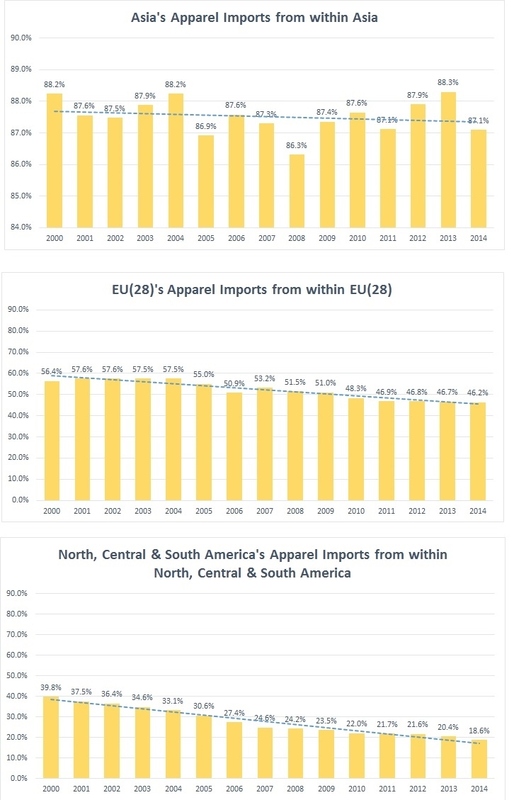 Additionally, developing countries in North, Central and South America still heavily rely on regional supply of textile inputs; at the same time, their finished apparel are also mostly consumed within the region. 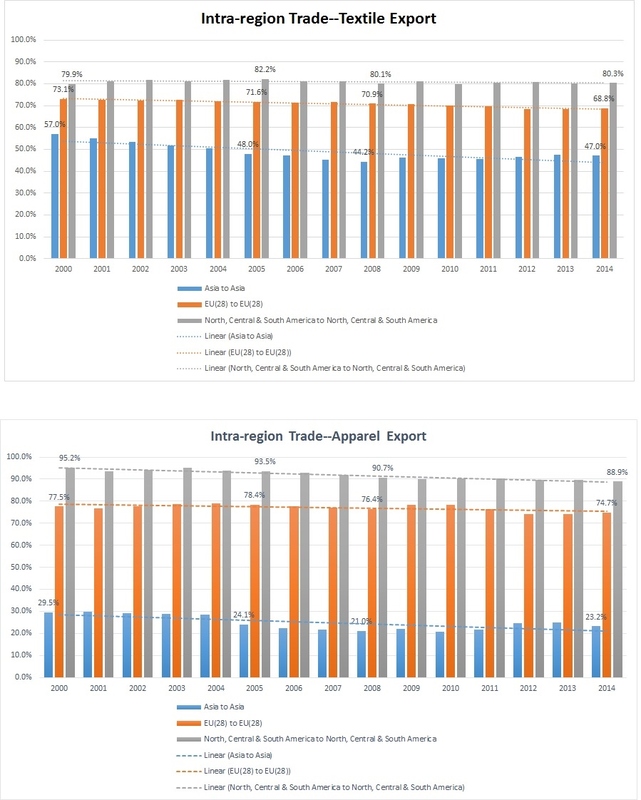 Data show that 80.3% of American countries’ textile imports still came from within the region in 2014; at the same time, 88.9% of American countries’ apparel exports were also shipped to the region, mostly the United States and Canada as the final consumption market. I think the trade flow mentioned in the last paragraph is particularly interesting. 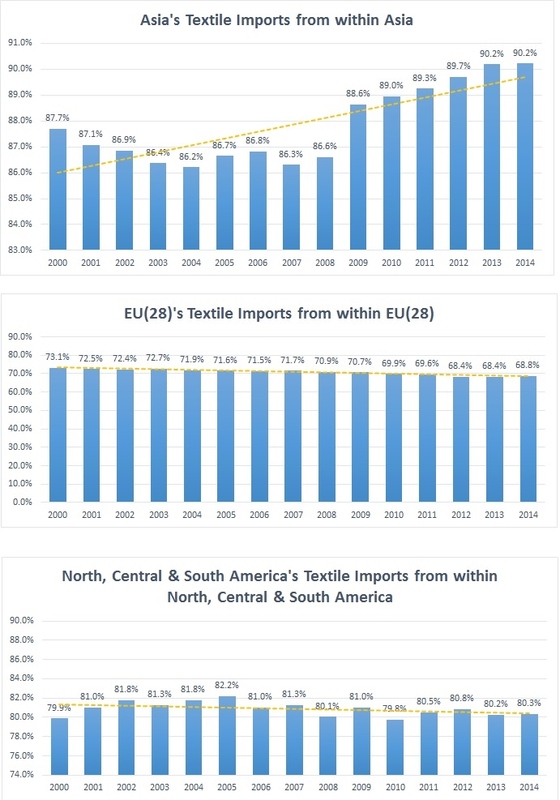 I would not think that developing North and South American countries are purchasing a majority of their textiles from neighboring regions and then selling them to the final consumers in Canada or America. It is interesting to see such close regional interaction between developed and developing countries. I think it is a great symbiotic relationship of experienced textile producing countries and apparel producing developing countries. We will learn this regional trade pattern in a few weeks. The regional textile and apparel production-trade network within America is also often referred to as the “Western-Hemisphere Supply Chain”. The last paragraph says that 88.9% of apparel exports from American countries were shipped within the region. It will be interesting to see how TPP affects this statistic. The US might now import more apparel made by members of TPP. If the US imports more from TPP members, it will import less from the NAFTA and CAFTA region. If the US imports less from the NAFTA and CAFTA regions, that would lead to those regions importing less US textiles. It will be interesting to see if the US imports from TPP countries are reciprocated by importing US textiles. good thinking! 88.9% actually reveals that countries such as Mexico and central America heavily rely on the U.S. as an export market for their apparel products. You may wonder why doesn’t Mexico also export to EU?This is largely because “Made in Mexico” has no “genuine” price competitiveness without the help of NAFTA. They feel too comfortable with using fabric imported from the U.S. and have no strong incentive to develop the local textile industry. Somehow this is very short-sighted. and TPP will post a major challenge for apparel exporters in Mexico and Central America. I think that this concept is something a lot of companies and countries should know about and look in to. Having a vertical system between countries that are demographically close to each other would be very beneficial. They would be able to manage their supply chain to produce goods in the country where it is most economical for them. This chain would also greatly reduce lead times for manufactured goods because textiles could be made in one country, but then the country that makes those textiles into the apparel would be close by instead of shipping goods all over the world. It turn sourcing into a much more sufficient system, as long as they figured out exactly which countries to add in the vertical strategy. I do not find it surprising, but I do think it is very interesting to see in numbers how significant Asia is as a whole in terms of both textile and apparel manufacturing. The first graph clearly depicts how Asia is able to source efficiently in the region. In recent years, the textile imports from within Asia are not only higher than the US and EU, but also steadily increasing. I think that this really exemplifies the strength of Asia in the textile and apparel industry. 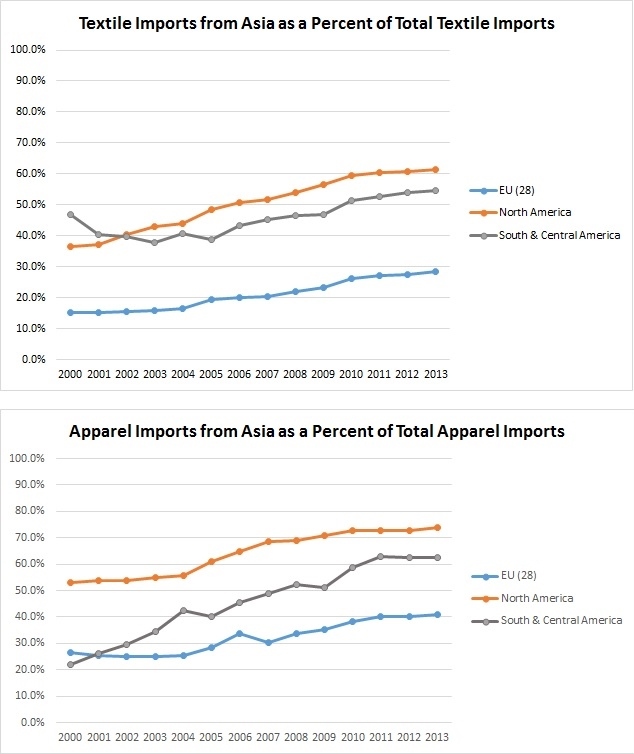 Though there is not as much a clear pattern with the apparel imports within Asia, they are still significantly higher percentages than are seen for the US and EU. Excellent analysis! My personal comment: Asia is a leading apparel exporter in the world, meaning a good proportion of apparel “Made in Asia” are eventually exported to the rest of the world (like the US and EU), On the other hand, most apparel consumed in Asia (over 80%) are sourced from within the region. The other 20% could be some high-end luxury apparel made in EU or US. Even in the 21st century, you still can hardly name any luxury apparel brands originated in Asia, but affluent Asian consumers really love European and apparel brands. Welcome for any follow up comment. That is what I was getting at! Though luxury goods don’t necessarily come from Asia, the whole region is just incredibly self-sufficient when it comes to the T&A industry which is a unique quality in today’s globalized environment. I see that other students are surprised that North and South American countries are purchasing textiles from neighboring regions and the final consumers are the United States and Canada. I was not surprised by this statistic, however I am curious as to how the TPP and NAFTA and CAFTA will change this. Great thinking! Agree! my recent study shows that the Regional Comprehensive Economic Partnership (RCEP) will help further integrate the textile and apparel supply chain in Asia. China itself is also becoming a growing apparel import market. It is interesting to see how the big landscape of sourcing and trade will shift in the years to come.